The NFL has unveiled a new TV commercial that highlights the many ways in which players are strengthening their communities and championing causes that are close to their hearts. The 30 second spot, narrated by Academy Award winner FOREST WHITAKER, debuted during halftime of the 2018 NFL Pro Bowl, and will continue to air on the NFL Network and during Super Bowl pregame coverage on NBC. Seattle Seahawks quarterback RUSSELL WILSON's weekly visits to the Seattle Children's Hospital, often accompanied by his wife and recording artist, CIARA. "Our ability to make an impact doesn't end the same day as our playing career does," said NFL Legend WARRICK DUNN, who appears in the spot helping a family move into their new home. "Thousands of NFL players continue to work and inspire others to do the same in their communities. I enjoy being in this group because it extends my ability to learn and grow as I mature outside of football." "We are extremely proud of our players' dedication to their communities, from hospital visits to USO trips to making a difference in underserved neighborhoods," said NFL Chief Marketing Officer DAWN HUDSON. 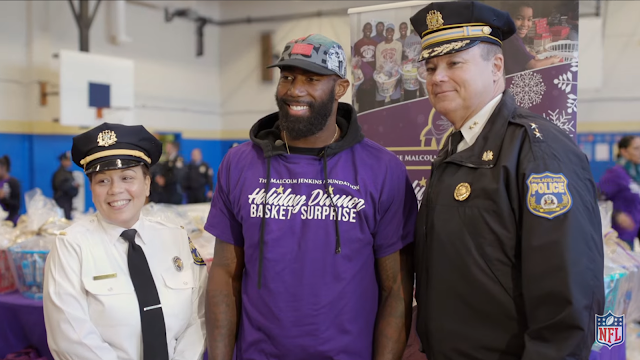 "This new spot reflects the ongoing partnership with our players to making a difference in neighborhoods across the country, and we will continue to work together to shine a light on these important causes." The commercial comes on the heels of a range of announcements by the NFL about its collaboration with the Players Coalition around social justice, including a newly formed working committee of owners and players to oversee and co-develop community-based initiatives in partnership with the league. The Pro Bowl will be televised live from Orlando's Camping World Stadium on Sunday, January 28 at 3:00 PM ET on ESPN, ESPN Deportes, and ABC. Additional information on the game and Pro Bowl Week festivities is available at ProBowl.com.